My dear friend Stephanie at S.J. 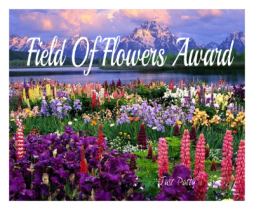 Thomas’s Book Blurbs has nominated me for a beautiful award… the Field of Flowers! Thank you so very much Stephanie for honoring me and for your continual support and encouragement. Your friendship means so much to me. This is a fairly new award meant to show appreciation or say thank you or just to brighten someone’s day. You can read about it here or share the love and pass on your own field of flowers. Stephanie writes thrillers (aka – spooky stories). Besides her writing, she loves gardening and cats, of which she has many. She is fearless – she jumped out of a perfectly operating plane, for gosh sakes! But most important of all, Stephanie is a loyal friend who always makes me smile with her kind and thoughtful words. I would like to give this award to all of my blogging friends because you are all so wonderful and have been so supportive of my blogging efforts. However, I am supposed to choose just seven (this is the really tough part) to nominate for this award. 1). Maxima. Maxima writes the most beautiful poetry. He is a true romantic. I get lost in his words and can feel the love he pours into them. In the spirit of the love he shares, Maxima pairs his poetry with pictures, most often of roses, the ultimate symbol of love. 2). Lisa Alber’s Words at Play. Lisa’s debut novel KILMOON is due out this month. Congratulations Lisa! What does she like to read? Crime mysteries! Lisa blogs about books and writing. I love reading Lisa’s blog and have learned so much from all of the wonderful writing tips she shares. 3). Julie Valerie’s Book Blog. You just have to love Julie! She is a true and loyal friend in every sense of the word. One of the things I love most about Julie is her sense of humor. When you check out her blog go to the page link Contemporary Women’s Fiction & Modern Lit Authors. This amazing lady has a list you can link to your phone for use at the library or bookstore to help you more easily find women’s lit and modern lit authors. 4). True Stories. I never know what the topic is going to be when I stop by this blog, but I know I am going to enjoy reading it and learn something in the process. All of the stories are true (oops, I guess the name of the blog is a dead giveaway). Jessica is a great friend and has been a true supporter of mine from my earliest blogging days. She has always wanted to write a book and her dream is nearing fruition. Her first book THE ROOMS ARE FILLED will be published in April 2014. Congratulations Jessica! 5). Colline’s Blog. Colline is a kindergarten teacher and is a shining light for her young students. Her blog is so uplifting and always interesting. Her topics cover a wide range. As Colline states on her biographical page, “My blog is an expression of who I am; a potpourri of my experiences, thoughts, and feelings”. Stop by Colline’s Blog and say hello to this warm and amazing person. 6). 4writersandreaders. This is the blog of author Bette A. Stevens. This is a must stop by location. Bette blogs books and is an avid supporter of childhood literacy and the protection of monarch butterflies and their habitat. She is also an advocate for kids & families. Besides blogging books, you will also find posts about these things and all things nature as well. 7). Book Journey. Sheila describes herself as a “Bookaholic, Audio Book Fan, Bike Rider, Rollerblader, Adventure Seeker, Want To Be Runner, Coffee Lover, Fitness Fan, Movie Junkie.” I can’t attest to most of that, but I do know she is an awesome book blogger and she always has a photo of her drinking her coffee. I love her straightforward reviews and have followed her advice and picked up some of the books she recommends. Congratulations to all of my nominees. To my readers, please stop by these amazing blogs. Hi, Patty over at Petite Magique (http://petitemagique.wordpress.com/2014/01/17/field-of-flowers-award-yea-its-a-new-one/) created it. Michelle, I just realized that forgot to spread this award on to seven more bloggers! I apologize for that. March being KILMOON launch month: nuts! Hopefully, I can get to it this week or next. That’s okay. You have far more important things to be thinking about with KILMOON’s launch. Well deserved CONGRATULATIONS to you, Michelle. You’ve got a wonderful blog–a beautiful field of flowers for your followers– and are such a great supporter to us all. KUDOS! Thanks for the honor of passing this award along to me. Have a fantastic year! You are more than welcome. Your comments apply equally to your blog. Do you ever sleep, Michelle? You are an absolute whiz at blogging. How do you ever keep up with everything? (I need to come to your house so you can teach me some time management skills. I’ll bring a bag of English Breakfast loose tea leaves. Do you like English Breakfast tea or are you a coffee drinker?) I am so incredibly appreciative to be the recipient of your blog award nominations. I’m always so very touched by them and wanted you to know. Thanks so much, Michelle! Thanks for stopping by. Yes I love tea and coffee! I start with tea first thing each day. Switch to coffee with my breakfast, then back to tea until dinner. I have a cup of coffee after dinner. I drink much more tea than coffee though. Julie, your blog is one of my favorites! I page through all of the others and save your’s and a couple of other favs for last, so I can spend more time reading them. By the way, I wish we did live closer so we could sit and chat while we drink our tea. I think we’d find we had more to talk about than time to do it. Nice award. I am dropping by from the A to Z Challenge. I am a minion for Tina’s Terrific Team. So pleased to see the badge. Let me know if I can help in any way. Thanks so much. It is so sweet of you to mention my blog. Aw thank you so much for your kind words! Brought such a smile to my face 🙂 Love all your nominations too… congratulations!! A huge thank you to Lindsey at The Day Dreaming, Candy Eating, Red Headed Bookworm (http://wp.me/p3yPk8-BV) for her wonderful and kind comments. Thanks so much, Michelle! What a great way to spread the love! Lisa, you spread the love all the time with your wonderful blog.